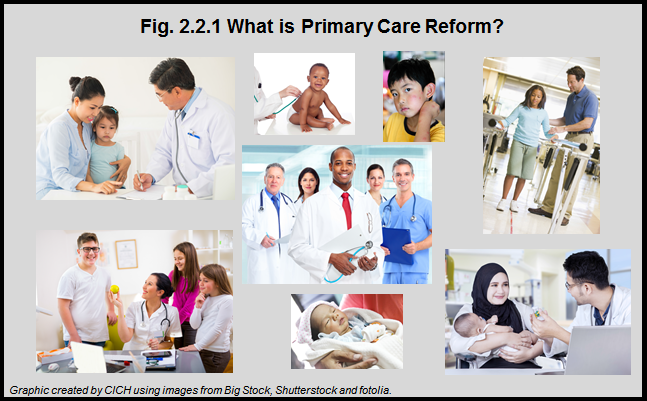 Home Modules Module 3 Section 2 What is Primary Care Reform? Across Canada, primary care reform initiatives have attempted to improve access and quality of primary care, resulting in the introduction of new models of care and policies over the past decade.1,2 Characteristics of reform models include patient rostering, interprofessional care teams, changes in physician reimbursement methods and requirements for after-hours care.1 In addition, financial incentives have been introduced to enroll new children and adults and to provide comprehensive care to those who are vulnerable, notably young children and those with chronic diseases.3 Currently, there is insufficient evidence evaluating the effectiveness and quality of primary care since the introduction of these reform initiatives as they pertain to the care of children and youth. 1Levesque J, Pineault R, Grimard D, Burge F, Haggerty J, Hogg W, Katz A, Wong S. Looking backward to move forward: A synthesis of primary health care reform evaluations in Canadian provinces. Quebec: Agence de la santé et des services sociaux de Montréal/Direction de santé publique, Institut national de santé publique du Québec; 2012. 2Hutchison B, Levesque J, Strumpf E, et al. Primary health care in Canada: Systems in motion. The Milbank Quarterly 2011;89(2):256-88. 3Ungar WJ. Public drug plan coverage for children across Canada: A portrait of too many colours. Healthcare Policy 2005;1(1):100-22.